Enter to Win 2 Tickets to The Beach Boys, Live at the Kings Theatre! 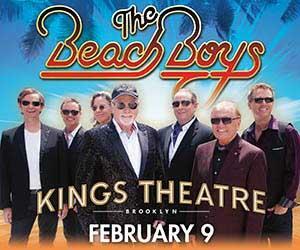 Comments Off on Enter to Win 2 Tickets to The Beach Boys, Live at the Kings Theatre! The Flatbush Avenue BID and Church Avenue BID have partnered to giveaway 2 tickets to see The Beach Boys perform live at the Kings Theatre (1027 Flatbush Avenue) on Tuesday, February 9th at 8:00 PM! Click HERE to enter this free sweepstakes. Registration ends Tues. Feb. 2 at noon. Winner will be contacted directly and will be announced on the BID’s Facebook page.